IWM rose by 0.1% again this week, while my account was unchanged. The loss-floor has fallen to -7.8%. Holiday: Tuesday was Remembrance Day (= “Veterans Day” in the US). Markets were open, but trades did not settle. URTY: The TRIX(s) indicator is flattening out. This might sell soon. 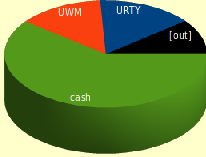 UWM: Doesn’t look very hopeful, unless the market jumps next week. YHOO: “Buy” signal for Monday. Seems quite unlikely that the limit-price will be reached.